The African King of Comedy was 1st hosted in Lagos last year @ Eko Hotel,this 2nd instalment has been structured to be more universal in terms of viewing and participation which is why Barons Entertainment anf cokobar.com came together to stream the show live on the web. 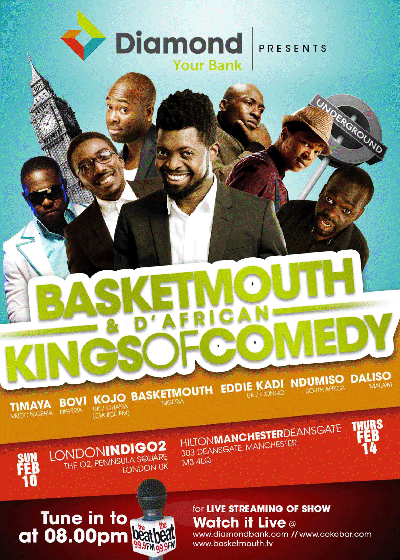 The show will feature Kojo,Eddie Kadi,Ndumiso Lindi,Daliso Chaponda,Bovi,Timaya and Basketmouth as the host. Live streaming starts @ 8pm Nigerian time and can be viewed worldwide. The streaming is powered by Diamond Bank. Supported by Beat FM and Linda Ikeji. Am I the only one who thinks that Basket mouth is no longer funny like he used to. The reason why you think that way is your problems have taken over your life. Being a comedian is not easy and sometimes they are funny because they are humans. But my guy, if your wife don leave you or you now only eat 1 square meal a day, please don't spoil the fun for the rest of us. Even mad man for road dey laugh at himself. Yes U are d only one. By the way linda I just read on twitter dat channels sport news presenter joe igholi died last night cn u tell us more abt it? Nice one! ‎​ℓ̊'ll try † be there. cant wait to attend this..
Micheal! You are 100% right. Most of these people are now reasoning -vely cus their lives have been totally engrossed by poverty and infact all negativities. These comedians are still funny , it is your problem that has turned to Iroko tree compared to the you g trees it used to be some years back. Thanks. As you are preparing for the show, don't forget to contact me on 08032286171 for your makeover. He is not funny anymr! I tot am d only person noticing that Nigeria Comedians re not @ it like b4... Nowadays some of their comedy re boring.. Been a comedian is about always wanting to make plpp laugh no mata the situation of this. But recently I notice that even a man dat is smiling b4 some comedians can't make him laugh talk less of a man dat is unhappy ... I Go dye is a good comedian I love cause he's born wit it and doing his job well.. If I PAY U to make me LAUGH and u cannot that smile means U collected my Money by trick and didn't render any service cause everybody dat pays for ur show is dere to LAUGH... 'Still watching from my OCEAN . Badbelle pipz wld nt kip shut...always spoiling pipz bizness. If u think they aint no more funny...Stay home n sip garri. its not even allowing me to watch it live cus i live in london...sighs..so whats with the hype then...kmt!! !